I’ve changed the oil in may motorcycles, but the first oil change in the Triumph Thunderbird Sport was a real adventure! I felt like a rookie again. Changing the oil and filter in a motorcycle shouldn’t be this hard. Here are some observations and tips that may help owners of the Triumph Thunderbird Sport and other Triumph motorcycle owners. The owner’s manual, the Haynes manual and the official Triumph motorcycle shop manual all call for 4.00 liters of oil with an oil and filter change in a Triumph Thunderbird Sport. 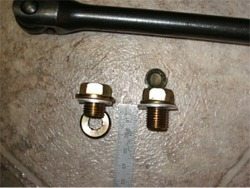 Open the 8mm Allen key drain plug and drain the oil (per the photo on their page 1-14); then loosen the 17mm hex nut on the oil filter cover and let that drain also. I went in the house for a while to give the oil some time to drain. A little while later I went back in the garage, and everything’s done draining. I put in a new filter, buttoned everything up and start pouring in the new liquid gold. Exactly 2.5 liters later, the sight glass shows that it’s full!! How can this be?! The book says it takes 4 liters! I started up the bike up and everything seemed fine (by the way, a good tip is to shut off the fuel on your ride home prior to changing the oil, then let the bike die in the garage from lack of fuel. This will allow you to turn over the engine with the starter after the oil change to build up oil pressure prior to starting it up). So I decided to search for some answers. I learned some interesting things from various sources: the site glass is wrong (probably true; see below); and a guy with a Triumph who works at the local Harley dealer told me that the bike only takes 3 quarts (2.8 liters) of oil. How can this be, when the owner’s manual, the Haynes manual and the Triumph shop manual all say it takes 4 liters? So I figured the only thing to do would be to drain out all the now wasted $50 oil to start again with an empty engine. Out came the 8mm Allen screw; I opened up the filter cover and drained everything once more. This time I measured it with a 500cc graduated cylinder. 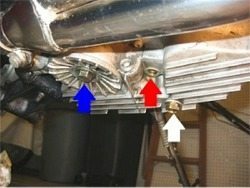 (L) Oil pan from right side: blue arrow = oil filter cover (17 mm hex); red arrow = center 8 mm Allen bolt; white arrow is the other (correct) 17mm hex drain plug. (R) Oil pan, left side: yellow arrow indicates the correct 17 mm hex drain plug. How Much Oil Does the TBird Need? All I got was the 2.5 liters!!! What’s going on here??!! Either there HAS to be another oil drain plug, or I’ve got a serious problem with 1.5 liters of old oil hiding somewhere! So I looked under the bike and noticed the 17mm hex bolt on the left side of the oil pan near the side stand. That HAS to be another drain plug! But they don’t say anything in any of the books about it! Slowly, slowly, I loosen the bolt. It looks like it’s never been opened before — I see no traces of oil or grime. I slowly turn it out until almost the very last threads and… OIL!! There’s another friggin’ oil drain plug on this bike that the book didn’t tell me about! I let it drain, measure it in the graduated cylinder, and guess what?? Yep, it all adds up to 4.0 liters exactly. Moral of the story? There are TWO oil drain plugs, at least on my T-Bird Sport. When I go back and look closely at the Haynes photos, I see they’re definitely opening an Allen bolt drain plug, and now that I know what’s up, I can see that it does appear to be on the left hand side of the oil pan, which I never noticed after looking at the very poor photograph many times. On my bike, the Allen bolt was in the center hole, so not knowing any better, and this being my first oil change, it’s the first one I saw and the it’s the one I removed, following the lead of the Haynes photo. Perhaps someone got them switched? Maybe you’re never supposed to open the center hole? What does the plug for the center hole in the oil pan do? Now that I realize what is going on, I discovered that you should only drain the oil by unscrewing the drain plug on the left hand side, because it’s lower than the central drain plug. If you do it carefully, and only use the drain plug on the left hand side, you’ll eventually get all four liters out of the bike. Honda replacement plug (left); original Triumph plug (right). 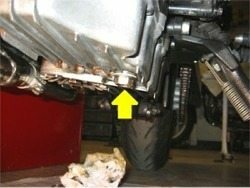 What are the correct torque values for the oil drain plug and/or oil filter housing bolt? The Triumph shop manual advises “…tighten to 48 Nm for M22 drain plugs and 28 Nm for M14 drain plugs.”, while the Haynes manual advises 48Nm for the oil drain plug and 18Nm for the oil filter center bolt. Note that the Haynes manual does not distinguish between the M14 and M22 drain plugs. Since my Thunderbird Sport has an M14, 17mm hex plug, I’m sticking with the 28Nm for the oil filter drain plug. I first tried about 38Nm, and it felt like the bolt started to slip, the first sign of stripped threads! It doesn’t take much to strip the threads in aluminum, so be really careful! Now I needed a new oil drain plug, and of course, the dealer didn’t stock one! BUT – I found out that the Honda automobile plug will work by looking at the information on theCG Enterprises website. 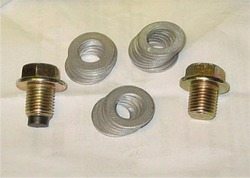 If you ever need an oil drain plug, or the crush washers for your bike, they have zillions of them in all different shapes and sizes! They also have a cool magnetic-tipped drain plug of the correct size that I’ve ordered and will install at the next oil change. I needed a drain plug RIGHT NOW though, so after I realized from comparing drain plug sizes on the CG Enterprises site, I went down to the local Honda car dealer and purchased a Honda (car) part number 90009PH1000 (oil drain plug) and a crush washer, part number 9410914000I. $2.16 for the plug, $0.60 for the washer! The Honda part has 4mm shorter threads than the original Triumph, so it’s not exactly the same, but so far it has worked for me without any problems. The Honda crush washer is 14mm inside diameter, and 24mm outside diameter, just like the original part. It has a 17mm hex head with a round shoulder under it that measures about 21mm diameter. CG Enterprises part number 1085 is an M14, 14mm x 1.5 thread pitch drain plug, with a thread length of 14.85mm, a 17mm hex head and a shoulder diameter of 24.8mm. The CG Enterprises part number 1085M is the same plug with a magnet which adds 4.8mm to the overall length. Finally, don’t forget the aluminum crush washer! The shop manuals recommend that these are replaced each time the drain plug is removed. I believe that my not replacing this was the major factor for stripping the Allen-headed drain plug. The Triumph aluminum crush washer dimensions are 1.5mm thick by 24mm outside diameter, to fit over the 14mm threads. The CG Enterprises part is an identical replacement; their part number for the aluminum crush washer is 2402 is a 14mm aluminum gasket with a 23.85 O.D. and 1.53mm thick. For more information, contact Gary Grave, C.G. Enterprises Automotive Inc.
Here’s a photo (above) of the magnetic oil drain plug, part number 1085M (left side of this photo). I’ll install it at the next oil change but will make sure there’s enough clearance over the magnet — I’m 99.9% sure it will be OK.
At the right is the standard replacement drain plug, part number 1085. In the center are the 20 aluminum crush washers I ordered. Neither the local Triumph dealer or hardware store had the proper aluminum crush washers, so as long as I was placing an order, I bought a handful. I guess this should hold me for a while! Both manuals claim that the oil level should be half-way up the sight glass when the bike has the full complement of 4.0 liters of oil. But with the 4 quarts (3.784 liters), the oil level is already over the top of the sight glass when the bike is exactly level. webBikeWorld visitor “G.G.” wrote to say “Rick, That third bolt got me to wondering what the heck is that for. In my approximately 10 oil/filter changes I have never removed that one. If you look in the Triumph Manual (mine is issue 7, 10/97) on page 2.17 (Maintenance 2) you will see the drawing showing the sump drain plug and oil filter bolt that are to be removed during an oil/filter change. The third bolt, positioned between the two has a pipe coming from it. Now look at page 8.3 (Lubrication 8) and notice the drawing on the lower right hand corner that has got to be an oil cooling system. My guess is that the third bolt is for that system. The Haynes Manual only lists the torque spec for the M22 drain plug (48Nm) while the Owner’s Manual and Triumph Manual list torque for the M14 drain plug (28Nm). The two specs are mentioned in the text of the Maintenance section, on the torque spec charts in the General Information section and in the drawings in the Lubrication section of the Triumph Manual. The “how-to” photos and drawings show the M22 drain plug which is not on the TBS engines AFAIK. My parts catalogue (Issue 7, 07/00) does show three sump part numbers but only one number for the M14 drain plug. It does not help us that Triumph and Haynes refers (correctly I found out) to fasteners by the size of the hole they fit into, not the tool that goes in/on them. By the way, I received another note stating that a TBird Sport owner had an M14 drain plug with a 13 mm hex head that was installed OEM with left-handed threads! So be careful — if your plug is not unscrewing, don’t overdo it! It’s hard to believe, I know, but there may be some TBirds out there with left-handed threads! Who knows if that same person used a different brand or weight of oil if the bike still would have gone 300,000 — or maybe 400,000 miles? The point is, until someone does some very scientific study comparing oils, a good bet is to use whatever the owner’s manual recommends. The market is so competitive nowadays that most oil is of excellent quality anyway (and probably made by same manufacturer), so it would be hard to go wrong with any name brand oil. In the case of the Thunderbird Sport, oil type is a bit confusing, but easy to resolve. The owner’s manual and the shop manual call for either 10W40 semi-synthetic or 15W50 full synthetic motorcycle oil. The shop manual on page 1.34 calls for 10W40 semi-synthetic with an API grade of SG. On page 2.16 of the shop manual, and in the owner’s manual, either 10W40 semi-synthetic or 15W50 full synthetic “which must meet or exceed API SG specification” is specified. There’s a difference here, and to make things more confusing, the Haynes manual calls for “fully synthetic 5W40 or semi-synthetic 10W40 motorcycle oil”. My advice is to disregard the Haynes manual (I bet they dropped a “1” in front of the “5” in the 5W40 during printing or something), and go with the Triumph shop manual’s specification for 10W40 semi-synthetic or 15W50 full synthetic “which must meet or exceed API SG specification”. The Mobil 1 ” 4T” racing oil that is recommended by Triumph doesn’t list an API specification or a weight on the 4.0 liter jug. It’s a European specification oil and I’ve confirmed with Mobil that 4T is only sold in the U.S. under the Triumph label in those mucho expensive 4.0 liter jugs. It’s $49.95 for 4 liters, which is completely outrageous. As of the date of publication, Mobil1 does not offer motorcycle oil in 15W50 weight in the U.S.A. and Mobil U.S.A. recommended to me in an email to use their 20W40 synthetic as a replacement, but then that doesn’t meet Triumph’s specs for oil weight. So you pay your money and you take your chances: I plan on using 15W50 full synthetic motorcycle oil (do not use automobile oil, as it may be too slippery for the wet clutch lubrication in any motorcycle that has them). 15W50 is not that easy to find, although that grade is made as a motorcycle oil by Amsoil, Spectro, and others, and can usually be found at your local motorcycle dealer, albeit for anywhere from $6.50 to over $12.00 per quart. I have been using BMW 15W50 fully synthetic, API SH rated. This oil has been very highly rated in several tests, the most exhaustive being the tests conducted by Motorcycle Consumer News in the August and October 2000 issues. By the way, this is a great monthly magazine that does not accept advertising, and runs detailed tests on motorcycles and motorcycle products. The BMW oil is always readily available at my local BMW dealer for about $6.00 per quart; still very high-priced, but about 50% less than the Triumph stuff, and it costs just about the same as the Mobil1 motorcycle oil. Update: I’ve also used Golden Spectro 10W40 semi-synthetic, which now comes in 1 liter containers and meets API specification SL (2005). By the way, 4 quarts of oil is only 3.784 (3,784 cc’s), not the 4.0 liters that the bike should take when empty. This means if you put in 4 quarts, you will be short roughly 5.4% of the total theoretical oil capacity. This shouldn’t make a difference, but you may want to buy a 5th quart to have around and measure out the exact amount when filling the empty engine with a 500cc graduated cylinder. I don’t know why the Thunderbird owner at the Harley dealer (they used to sell Triumphs) said that he only puts 3.0 quarts in at an oil change — that would only be 2.84 liters, which would be leaving his bike approximately 29% short of the correct amount of oil; I think this is dangerous. NOTE: Use at your own risk! Listing here does not mean that these parts are direct replacements; I have no idea whether or not they meet the same specifications as original Triumph parts. Here’s a list of what are claimed to be replacement oil filters that will fit the Thunderbird but are produced by various manufacturers. From “J.D.” (July 2015): “It’s definitively the hex screw on the right side of the sump, (when looking at it lying down under the bike) that has to be loosened for the 4 liters of oil to flow out of the sump. I must say the Haynes manualis unclear about it but the drawing shown speaks for itself. I got exactly 3.8 liters while doing so that I duly replaced with 4 liters of clean new oil as stated in the manual. The “porthole” on the right side of the engine is, I confirm, totally useless so I had to trust Haynes on that one. The problem rather lies with the oil filter. K&N lists two different air filters for the TBS relative to model years: KN-204 and KN 192. I ordered a KN-204 for my 2000 TBS (which K&N was listing as the one needed) but when I opened the filter cartridge on the bike a KN-192 came out.